LynchyRightNow: Warming Up: KEEP IT REAL! From "Starbury" in The Bean, to Tiger back on the Green, KEEP IT REAL FRIDAY is warming up for the month of March, the World Baseball Classic, March Madness, and two months away from the NFL DRAFT. GET READY TO KEEP IT REAL! Disclaimer: I understand this is being released on a Saturday morning, but that was planned. Of all the things that went on this week in the world of sports, I wanted to see Stephon play with the Celtics before I released this weeks installment of KEEP IT REAL FRIDAY! I'm a Boston Celtics fan, you know that. But this one is a little hard for me to accept. When the Celtics won their 17th championship last season, they had a team with guys like P.J. Brown, Kevin Garnett, Paul Pierce, Ray Allen, you know, guys who wanted nothing more in life than to bring that banner to the new Garden. While they are still on this team, so is Stephon Marbury. Like Marbury's game, can't stand Marbury. Would it really be fair if this Celtics team came back and won a second straight championship with this guy on the bench? The guy who refused to play for Mike D'Antoni and the Knicks, probably caused a couple front office guys to smoke a few more butts, and just added to the general dislike of Isiah Thomas and the franchise that plays at MSG, could now potentially be playing in June for a shot at a title? I'll tell you one thing, it isn't going to have the same feeling as watching guys like P.J. Brown and Kevin Garnett hug the gold basketball, it'll be different. In game perspective, Marbury helps this team, I watch the Celtics every night and the only thing they were missing is a back up true point guard who can make his own shot, that's what Marbury does. When you have a starting point guard in Rajon Rondo having 17-assist nights, all you need Marbury to do is give him a breather once in a while and inject some offense into the second team at the end of quarters. Steph displayed that on Friday night. Secondly, you've got to remember who he'll be playing against, other teams backups, and Marbury still has starter potential in those legs, as tired as they looked last night. I can't stand the guy, but if it's only for a few months, I'll deal with it. KEEP IT REAL! True. Tiger Woods won't be playing come his first weekend back from knee surgery. Your next door neighbor, Tim Clark, ousted Tiger on Thursday afternoon in match play. Fear not, Tiger is prepared to pull on his 5th green jacket come the first weekend in April, put it in the bank. Now let me make it clear, I'm no expert on golf, but in this case, Tiger has something to prove. Like Jordan after his baseball stint, like Josh Beckett in the 2007 postseason, psst (like Tom Brady come the 2009 NFL season), Tiger Woods will arrive in Augusta with a chip on his shoulder, or knee. When big game athletes like Tiger Woods have that proverbial chip, the field better watch out. Tiger Woods is chasing down golf records, tearing them down when he gets there, if you think a knee injury will stop him, I've got something for you: KEEP IT REAL! He's the biggest athlete since Michael Jordan, by the time it's all said and done, between Nike and Gatorade, he'll be the biggest athletes since errrrrrrrr, EVER. 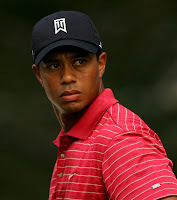 I only watch golf when Tiger is involved, I'm "that" fan, and when El' Tigre was on the shelf, so was golf. Get ready, Tigermania is back, and Augusta awaits. Some things in life are going to put that weird "who farted" look on your face. This week, it happened. The Washington Redskins inking free-agent, defensive tackle, Albert Haynesworth, to a record setting deal which includes $41 million dollars in guaranteed money and then signing free-agent cornerback DeAngelo Hall, to a deal that includes $22.5 million in guaranteed. Gentlemen, may I say it again, we are in the midst of the worst economic down turn, in this country, over the last THIRTY YEARS! Washington Redskins owner, Daniel Snyder, has to be feeling the money pinch like the rest of, right? Apparently not. The All-Pro defensive tackle, Haynesworth, could possibly make up to $115 million dollars with the seven year deal he was just handed. Over the next thirteen months, Haynesworth will receive $32 million dollars, no matter what. While the economy continues to fall, and we debate how to fix it every day, Redskins owner, Daniel Snyder, seriously has more money than we could ever imagine, and isn't afraid to spend it. The NFL-free agency season started midnight on Thursday, and Snyder has already spent the $41 million guaranteed on Albert Haynesworth, and under-the-radar $22.5 million on free-agent cornerback DeAngelo Hall. Two players, $63.5 million dollars, one day. The bad part (as if the money wasn't enough) Haynesworth received the largest penalty for an on-field act, purposely stepping on Andre Gurode's face with his cleats, in NFL history. DeAngelo Hall, is a known locker room cancer, for crying out loud he forced his way out of Oakland, and you can't get more dysfunctional than OAKLAND! $63.5 million doesn't buy you what it used to, and Daniel Snyder doesn't care. KEEP IT REAL! While were on the money thing, because it seems to have taken over most of our lives, (especially when my employer is about to be nationalized and my 401k will be worth negative dollars, but I digress) Where are the Manny Ramirez fans? Because I've got a few things to say to them. This guy is too much. If I'm the Los Angeles Dodgers, I walk away and never look back. Listen, when the Mets, Yankees, and Red Sox say no thanks to a 40-homer, 100+ rbi guy, maybe you should listen. The Red Sox had Ramirez locked into what basically was a 2-year, $40 million dollar deal, that would force Ramirez to play for a contract, and play well, for each of the next two years. That is on one end of the spectrum. The Dodgers offered to pay him $5 million more dollars than the Sox would have given him, and at the end of year 1, he could work out a better deal with someone else if he wanted to or just return to the Dodgers at his choice and on their dollar. That's the other end. Good enough for Manny? No. This guy is a villain, how do you defend him in any way? While banking $20 million a year, he refused to play hard for the Red Sox in what became his final year in The Hub. He turned around, threw an entire franchise on his back after forcing his way out of New England, and managed to get what he wanted in the process. He turned into Willie Mays over the last three months of 2008 while with the Dodgers, and now he refuses to play with them for $45 million dollars. The unemployment is about to hit double digits in this country, and Manny Ramirez is holding out for what? $50 Million? You want to justify paying $50 million dollars to a guy who bats three times a game? So what if he got them into the playoffs last year, he was hungry then, what happens if you give Manny what he wants, you expect him to do what he did last year, again? I wouldn't have offered him the $45 million, but now? I'd pick up my things and walk away from the table. KEEP IT REAL! . . . . .I hope you enjoyed this weeks installment of Keep It Real Friday! Check back every Friday (Or in this case, Saturday morning) for more KEEP IT REAL!